The photograph is reproduced from R M Bevan's book "Hartford, Whitegate and Vale Royal" with the permission of the author and publisher - see the Books page for details of this excellent local history. 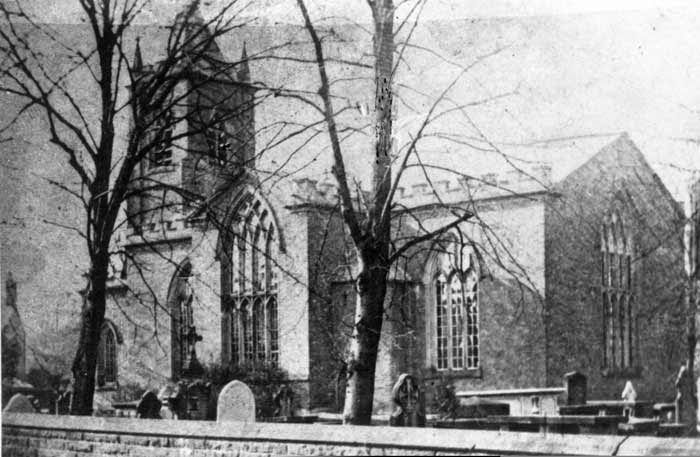 The photograph above shows the original St Johns church in Hartford which was consecrated in 1824 but later proved to be too small and fell into some disrepair. "The Chapel of Ease, dedicated to St John, is a neat brick structure in the gothic style, consisting of a nave, north and south transept, with a square tower and clock. The edifice has been built about 30 years. Thomas Marshall Esq., who died in 1831, was a munificent contributor to the erection. It contains a handsome octagonal font, the gift of Mrs Marshall. Two neat marble tablets ornament the north transept, in memory of the Marshalls. Over the south transept is placed the organ and singing gallery. The living is a perpetual curacy, returned at £117; in the patronage of trustees. James Royds Esq. is now the only surviving trustee. The Rev. James Royds. jun., incumbent. Double fees are paid for all funeral and wedding ceremonies performed in this chapel. Half the fees are paid to the mother church at Witton. The living has been augmented with £1000 Parliamentary grant"
It was demolished and replaced on the same site with the existing church which was consecrated in 1875. The architect for the new church was John Douglas, a famous local architect and designer of churches and notably, the Eastgate Clock in Chester. A history of St Johns Church can be found on their web site. "The vicarage, in the incumbency of the Rev. Edmund Eddowes, M.A., is valued at £117 per annum, with residence, and is in the patronage of Lieut.-Col. Marshall. The church, dedicated to St. John, is now being rebuilt, partly on the former site and partly on land recently purchased and added thereto. The edifice will be early Gothic, and consist of nave, chancel, transept, north and south porches, and tower surmounted by a broached spire; the transept on the north side of the chancel will be used for school children, and that on the south side will be occupied by the organ chamber and vestry; the nave will be separated from the aisles by an arcade of piers and arches. The walls will be Macclesfield stone, with dressings of Runcorn and Eddisbury stone; the roofs will be open timbered and covered with Broseley tiles; the chancel ceiling is to be arched in stone, with moulded ribs and cornice. It is to be fitted with open benches capable of accommodating 520 persons. The foundation stone was laid by Lieut.-Col. Marshall, on the 29th October, 1873, and it is expected to be completed by Christmas, 1874. Mr. J. Douglas, of Chester, is the architect." "The church of St. John the Baptist, entirely rebuilt in 1875 at a cost of £5,000 is an edifice of undressed Derbyshire, Runcorn and Eddisbury stone, consisting of chancel, transepts, clerestoried nave of five bays, aisles, north and south porches and an embattled western tower containing a clock and one bell: the south transept serves as an organ chamber and vestry: the reredos, of Caen stone, includes a representation of the Lord's Supper, after Leonardo da Vinci, and the east window is stained : the tower was added, and a clock placed in it, in 1889 at a cost Of £4,000 the church affords 470 sittings. The register dates from the year 1824. The living is a vicarage, net yearly value £234 with house, in the gift of Colonel T. H. Marshall, and held since 1864 by the Rev. Edmund Eddowes M.A. of Jesus College, Cambridge."